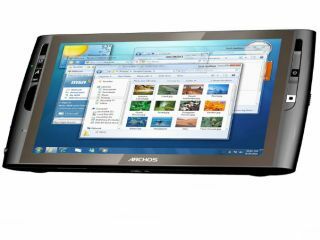 Archos has announced its new Archos 9 PCTablet is now on sale, bringing widescreen touch technology to the new Windows 7 OS. The new device will cost £449.99, and will be sold in the UK through PC resellers and Archos' own website. It might look like an overgrown internet media tablet, but it has all the necessary ports you'd expect on a tablet PC, with a VGA-out socket to connect to a monitor and multiple USB ports and audio jacks to extend your use. And as our hands on with the new device showed, it certainly is thin at less than 1.7cm thick and just 800g. It's also got a very slick touchscreen, despite being resistive, although touch typing on the large 9-inch screen can be a little tricky if you're holding it in your hands. It sadly only packs 60GB of HDD space, with another 25GB online, and users get £80 worth of credit to download films from the Archos Media Club. It might not be a traditional Archos device or rival the likes of the netbooks, but if you want a PC that will entice fellow commuters to peer at your new gadget, you should probably give the Archos 9 PCTablet a look.